I took this picture. No I didn't. Or did I? Also: bluffly adverb L18. bluffness noun M19. The game of poker is all about bluffing. Except that it isn't. But the word bluffing is all about poker, which is jolly interesting. Also interesting is that the OED's definition narrows the bluff to a pretence of strength, whereas making a pretence of weakness could also rightly be considered a bluff, as you attempt to draw an opponent into a situation that they've underestimated. In poker circles, the value of bluffing is often said to be overstated and a costly habit that beginner players often fall into as they constantly (and transparently) try and out-bluff more experienced players. Fascinatingly, while deception within a species was long thought to be a uniquely human behaviour, deception has been observed in animals, including behaviours that can be described as bluffing. For the time being, however, playing poker does remain a uniquely human behaviour, but the moment that some chimp is reported to have won a stash of bananas with a 2/7 offsuit, Lexicolatry will be sure to report. 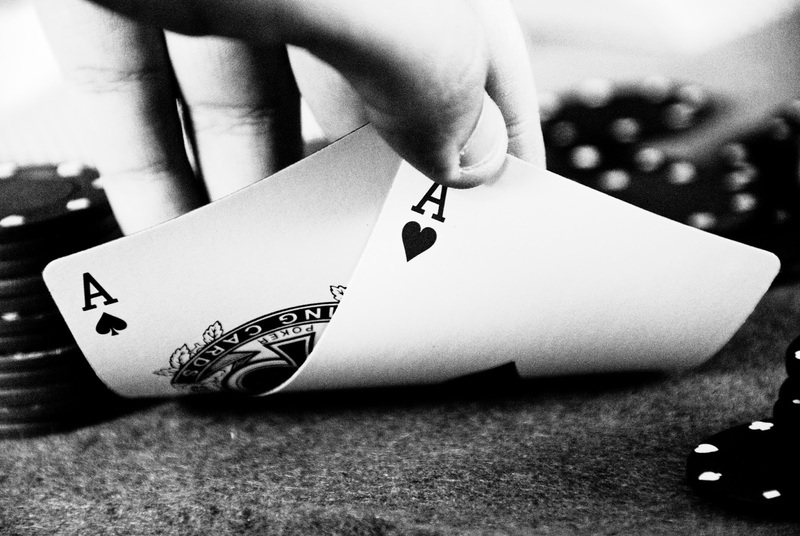 Are you a poker player that loves to bluff? Are you too transparent and honest to ever pull off a convincing bluff? Do please leave your most ambiguous comments below. A friend of mine has never been caught bluffing. He recently won 5/6 of a free coffee, a stamp and an assortment of chocolate bars, but no bananas. Not too sure what this teaches us. Bibi? This one might need your brains. Sounds like a savvy player. And the rewards are plain to see. I don't know about you, but to me it means he still has a long way to go. Bananas are the way to go, Clueless, bananas are the way to go. That's banan ... no, nuts ... that's nuts; that's what that is. There's all manner of poker-related slang, and I'm guessing a lot of it hasn't made it into the OED. Failing to bet a strong hand in order to feign weakness isn't generally known as bluffing, but rather as slowplaying. There's also the semi-bluff, where one represents a hand one hasn't made yet, but could - e.g. making a big bet when holding four cards of the same suit. The semi-bluffer would prefer everyone to fold, but if someone calls, he still has a chance to make his flush. That's what fascinating about bluff - that it's not even slang in general language now, and most people (including poker players like myself) wouldn't even first associate it with poker. You're right about the technicality of what's termed a 'bluff' - which is in line with what the OED says. Personally, I'd consider showing yourself to be very weak as a bluff though (both in poker and other situations). There's a similar thing in online FPSs (now I'm really showing my geek-cred), in which a well-armed player will pop their head around a corner and take a few pot shots with a pistol or some other weak weapon in the hope that someone will storm after him only to find he's actually got a BFG. artikel yang menarik untuk bermain judi online. bersama langitqiuqiu kami selalu mendukungmu. terima kasih. SingaPoker merupakan situs agen poker online indonesia terpercaya dan bandar poker terpercaya untuk permainan judi kartu Poker, Domino, Blackjack, Capsa Susun, Bandar Ceme Online dan Bandar Blackjack Online terpercaya, terbaik dan ternyaman di Indonesia dengan menggunakan uang asli. Judi Bandarq ialah salah satu permainan judi yang menggunakan dua kartu Domino, dengan nilai tertinggi yaitu Sembilan . permainan Judi Bandarq ada persamaannya dengan permainan Ceme . pertama kali saya mengunjungi situs ini, pertama kali juga saya mendapatkan informasi yang cukup menarik dan jangan lupa untuk peminat permainan judi online silakan bergabung bersama kami dengan mengklik keywarod di bawah ini.